Warren Beatty's epic about the life and death of American radical journalist John Reed. Stars: Warren Beatty, Diane Keaton, Jack Nicholson, Maureen Stapleton. Warren Beatty’s epic about the life and death of American radical journalist John Reed (1887-1920) whose book Ten Days That Shook the World was one of the first eyewitness accounts of the Russian revolution. Aside from its first-class cast, the movie uniquely featured interviews with more than two dozen “witnesses,” serving as narrators of Reed’s life and the great turmoil of the period. John Reed is remembered today, insofar as he is remembered at all, as the somewhat Byronic hero of American radicalism’s age of innocence. The author of Ten Days That Shook the World was handsome and dashing, an eloquent speaker, a superb reporter and a daring activist. And he died young, a casualty in the war for social justice. As Henry Miller remarks in Reds, Reed thought he could bring to pass the universal brotherhood of man—a notion that had also occurred to Christ, and for which He was crucified. It may be said, then, that Reed was a revolutionary saint, and saints, it is notorious, are uncomfortable companions for the commonalty. They are imprudent, intolerant and impatient; they are overbearing and can be cruel. We put saints on pedestals, that being the safest way to cope with them. Warren Beatty—who directed Reds from a script he wrote with Trevor Griffiths, and who plays Reed in the film is explicit about what it means to rub elbows with saintliness. Reds, like Chariots of Fire and Ragtime is a big historical machine, but it is not, as are those others, brightened by the varnish of nostalgia. It spans the churning second decade of this century, from the vain struggle of the I.W.W. to gather the workers of America into one invincible union, to the triumph of Bolshevism in the maelstrom of Russia after World War I. It is the period when Greenwich Village became the symbol of our native bohemia, when Eugene O’Neill was writing his early one-acters in New York City and Provincetown, when Max Eastman edited The Masses, when Emma Goldman laughed at her jailers, when not one but two American Communist parties split off from the decorous Socialists and when Lenin found power lying in the streets. In the center of this international turmoil, giving it dramatic shape and human scale, Beatty places the love, marriage and scarifying incompatibility of Jack Reed and Louise Bryant (Diane Keaton), the Portland, Oregon, dentist’s wife and emancipated woman who mistrusted Reed’s vision, hated the way he spent himself and followed him to the end of his desperate quest. The two aspects of this movie, the world stage and the personal romance, are almost grotesquely disproportionate, and it would have been fatally easy to let the private story dominate, producing a sentimental tale of love surviving the flames. Beatty makes clear the bruising relationship between Reed and Bryant, but he develops that side of the film always in the context of the social and political upheavals in which the lovers appear as both agents and pawns. From time to time, he and Keaton fill the screen with the vehemence of their characters’ competing wills, but then almost immediately they are swept away again by the storm. Reds is an emotionally taxing movie. Like any chronicle of noble aspiration (like Andrzej Wajda’s Man of Iron in these weeks of Poland’s crisis) it is heart-lifting, but we view it with tragic hindsight. As Beatty interprets his career, Reed was a lion among the American radicals, whom he both inspired and not a little frightened. But the Russians neither admired nor feared him; they merely used him. Beatty has made a considerable study of the man and his times. He sees the idealism and the folly; he is excited by the boldness of the dream and saddened by the awakening to darkness. As a result, his performance exhibits a strong grasp of Reed’s personality and a flexible accommodation to its range. Reed could reason and plan and brilliantly record; he could also rage and threaten. He was too uncompromising for any but the Bolsheviks, and they were relentless for purposes he failed to understand until he was on the point of death. 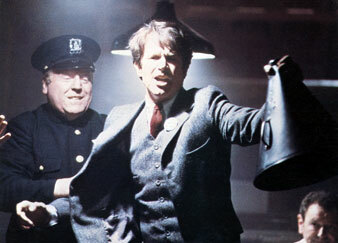 It is splendid acting, and Beatty gets similar work not only from Keaton but generally from the very large cast. I can mention here only a few of the players. Maureen Stapleton shows us Emma Goldman as an island of ironic sanity, a woman at ease with herself and strong enough to cut her losses. Since it is Stapleton who plays her, Goldman here is also possessed of an earthy bounce and humor. Jerzy Kosinski (author of The Painted Bird, among other novels, and making his debut as an actor) is stunning as Grigory Zinoviev, the Bolshevik leader. He is handsome and commanding, an eloquent spokesman for the revolution which he so effectively helped to strangle in its cradle. Jack Nicholson plays O’Neill, who is seen to have an affair with Bryant during one of Reed’s many absences. As always, he is fun to watch and impossible not to watch, but O’Neill was a morose and drinking man, and Nicholson has played that character so often that he fell into the trap of giving us the type instead of the man. It’s a pity, for the playwright is one of the important secondary figures in the film. In addition to the main cast, Beatty has brought together a group of thirty-two “witnesses,” men and women who knew Reed and Bryant and who recall the couple and their times. This chorus includes Roger Baldwin, Henry Miller, Adela Rogers St. Johns, Scott Nearing, Isaac Don Levine, Rebecca West, Will Durant, George Seldes and George Jessel—to list only the names that are most familiar. They break repeatedly into the narrative with personal anecdotes and contemporary views of what to us is history. It is a bold and effective device—an authentication of the past by the elders of the tribe. It is also astonishing. Reed died some sixty years ago; he must have then been in his mid-30s, and these people were roughly his contemporaries. As the names above suggest, the witnesses are a mixed group, but they have shared a tenacious hold on life (some of them, it is not surprising, have died since Beatty took their testimony). Reds runs for three and a half hours, with a brief intermission. That is very long for any picture, and I think too long for this one. The love story will not quite span the time, the embraces and lacerations of the relationship becoming repetitious. And the big historical scenes—political assemblies, military engagements, mass demonstrations of exultation—tend to be more noisy than enlightening. Beatty has a surer hand with individuals than with crowds. A half-hour, probably more, could be cut with no damage, and it will be done, I predict, when Reds is brought to television. But Beatty, who produced, directed, helped to write and starred in this impressive work, may be forgiven for not having the heart to cut it.